Students will be able to identify alliteration in text. 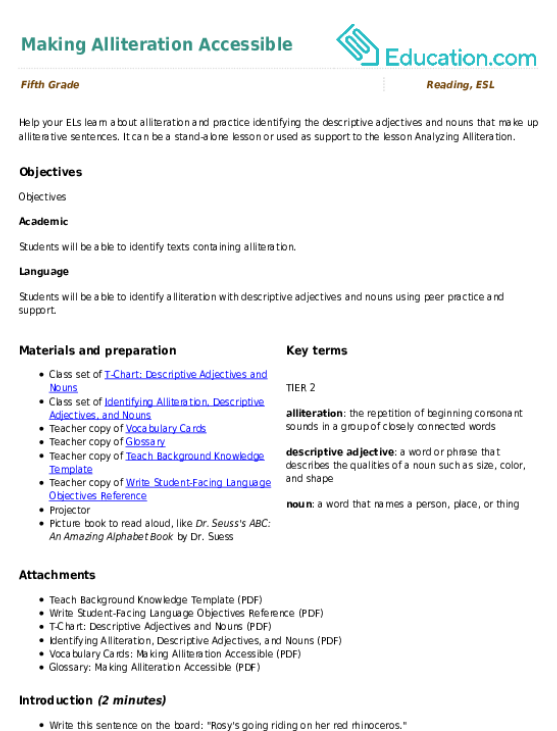 Use the Alliteration for Kids worksheet to introduce students to the content or review their prior knowledge. 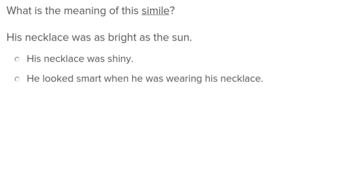 Have students identify the alliteration in each of the sentences on the worksheet. Allow volunteers to share their answers. Tell students that AlliterationIs the repetition of consonant sounds at the beginning of words. Tell students that metaphors are analogies that compare two unlike things without using "like" or "as." Have students identify the two things being compared and explain how they are similar. Explain to students that in this lesson they will identify alliteration in various texts and create alliteration of their own. 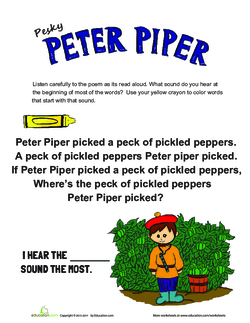 Distribute copies of the Pesky Peter Piper worksheet. 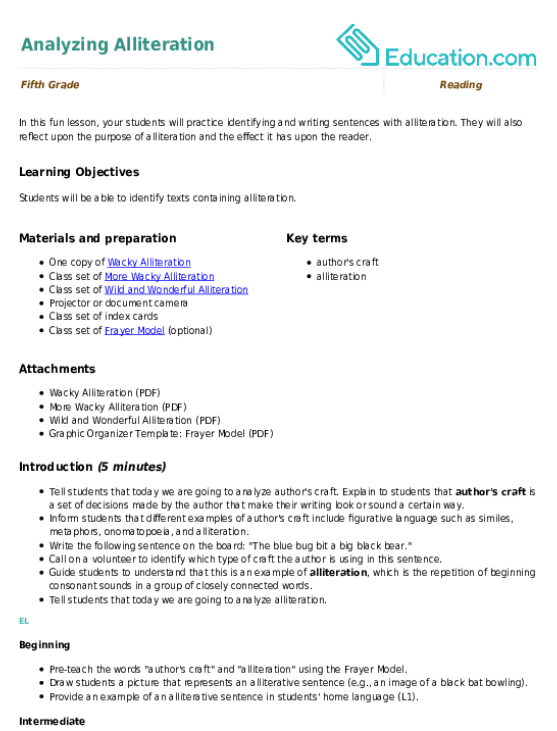 Have students read the poem aloud. Remind students that alliterations repeat consonant sounds at the beginning of words. 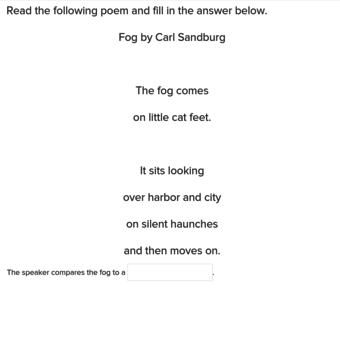 Have students complete the second poem by filling in a new consonant that creates a new alliteration. Tell students that this alliteration may not make sense, but it illustrates that the consonant or beginning letter. Let students know that they just created an alliteration. Allow them to create and read their second fill-in-the consonant alliteration if time permits. 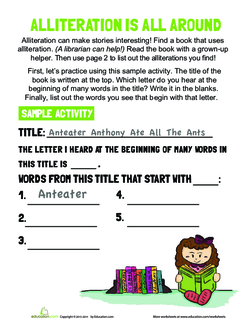 Have students work in pairs or small groups to complete the Alliteration worksheet. 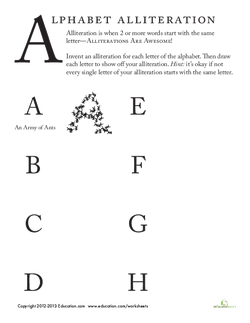 Read the directions for the Alphabet Alliteration worksheet aloud. Distribute the worksheet and have students complete it independently. Enrichment:Allow students to use the Alliteration is All Around worksheet to find alliteration in a library book or other short story. 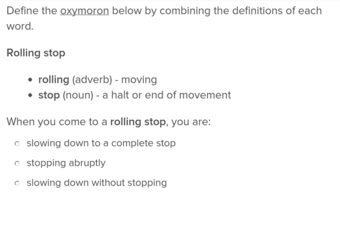 Support:Have struggling students complete the Fun With Alliteration worksheet, which has a word bank for support. 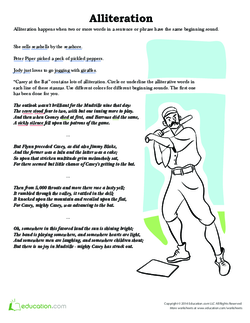 Have your students each create a paragraph that uses alliteration in at least three sentences. Have them circle or underline the examples of alliteration in each sentence. Have students explain in their own words what they learned today. Allow students to ask questions that they still have about alliteration. As students begin to read more sophisticated texts, understanding how authors use figurative language becomes critical. In this fun lesson, your students will practise identifying and writing sentences with alliteration. They will also reflect upon the purpose of alliteration and the effect it has upon the reader. Help your ELs learn about alliteration and practise identifying the descriptive adjectives and nouns that make up alliterative sentences. Use these wacky sentences to help your students recognise alliteration as they read. 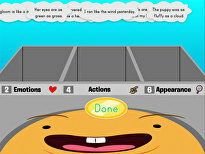 Students will love reading these wacky sentences to practise recognizing alliteration as they read. 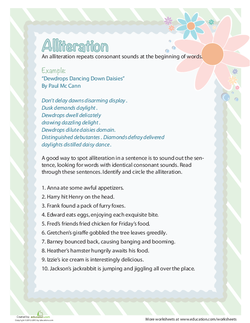 Students will laugh as they practise using alliteration in this fun writing worksheet.